White-clawed crayfish, Britain’s only native crayfish, have been found at release sites 15 months after the initial introduction and these signs suggest the project has been a success. Native crayfish numbers have been affected by non-native American signal crayfish, pollution, water quality and climate change. 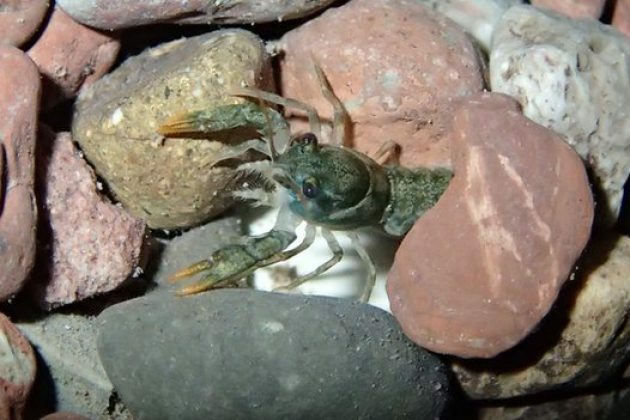 Over the last three years, Natural Resources Wales (NRW) has reared and released over 2,700 reared crayfish into the wild, and latest juvenile batch were released in a river tributary near Builth Wells. The one-year-old crayfish were reared at Natural Resources Wales Cynrig Fish Culture Unit and have been released into specially selected ‘ark’ sites on a tributary of the River Irfon, near Builth Wells. The release sites are chosen for their habitat and water quality and because they are free from non-native crayfish and crayfish plague, a disease carried by the North American crayfish invaders. Their sensitivity to chemical pollution is also a useful indicator of water quality so establishing a healthy population "would be a good sign that we are creating a better environment in Wales", according to Oliver Brown from NRW. "Rearing in excess of 1,000 crayfish in one production cycle is a real breakthrough for us," he added. "With few naturally abundant populations left in Wales, captive rearing is likely to be the most efficient way of providing crayfish to stock ark sites. Mr Brown said the project is part of wider work to mitigate the threats facing the white-clawed crayfish.